In iOS 10, Apple's Maps app does more, from making restaurant reservations to remembering where you left your car. If you haven’t been using Apple’s Maps app, the all-new version in iOS 10 is worth another look. It’s prettier than ever, smarter about finding stops for gas and coffee along your actual route, and thanks to machine learning iOS 10 it can do things like remind you when it’s time to leave for your next appointment, and then remember where you parked your car. I use Maps on a daily basis, after relying on Waze or Google Maps for years. A good mapping app is pretty important to me, since I moved from one side of San Francisco Bay to the other about three years ago, and I’m still learning the best ways way around, finding my new haunts, and scouting out those scenic routes where the view can make your jaw drop. I switched over to Maps permanently when I got my Apple Watch, because I love how the watch can tap me on the wrist before I need to make each turn—kind of a “hey, pay attention!” reminder when I might be engrossed in a philosophical debate with my 4-year-old. 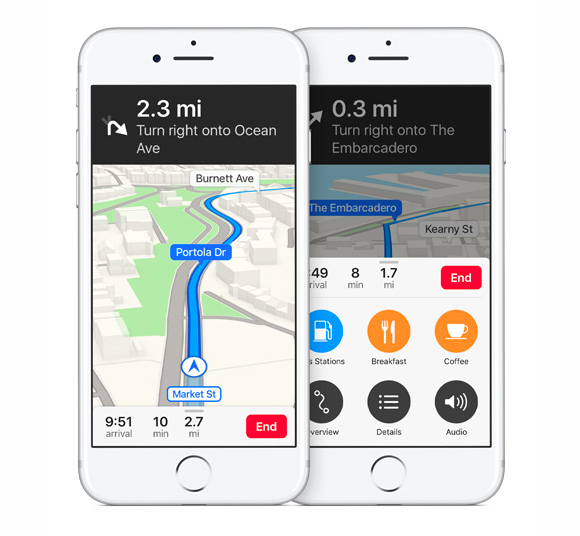 So while Apple’s got my mindshare for now, I admit I felt a little dread at WWDC, when Apple announced the Maps app in iOS 10 would be completely redone. Wasn’t that kind of a disaster last time? I’m happy to report the road forward is much smoother in iOS 10. The new Maps even fixes my biggest quibble with the last version. As I complained in this video, testing Maps with CarPlay in iOS 9.3, I hated when I’d search for a stop—usually gas or coffee—during a drive, only to be offered results I’d already passed. That’s a lot better in iOS 10, with the new app making it easier to find things that are actually on the way, and even letting you know how many minutes the stop is likely to add to your drive. When you open Maps, you’re even presented with a couple of predictive suggestions, like how long it would take you to drive to work, or to get home. The search box is on top of the list, and places you’ve searched for or navigated to recently are underneath, so you can just flick that list up with your thumb to see more. Your Favorites are down at the bottom, and can include transit stops as well as addresses, businesses, and points of interest. Everything’s been streamlined in iOS 10, from the very beginning when you enter a destination and choose what kind of directions you want. Maps does a great job of keeping controls out of the way until you need them. The Favorites list, for example, might seem a little tucked away. But if the locations inside it really are your favorites, you probably access them often enough to keep them in the recents list. When you tap on a place for more info, there’s a big blue bar to tap for directions, and it defaults to whatever kind of directions you wanted last time (Drive, Walk, and Transit). But on the next screen when you’re presented with the possible routes to take, you’ll see tabs that let you switch to another method of transportation. Those tabs have a new addition in iOS 10, too: Ride. You can tap this tab if you want to be able to call a car from Uber or Lyft without leaving the Maps app. First you’ll have to enable access, which will share your location info with the apps, which, naturally, must be installed on your phone. Once the app has access, it’ll show you all the car types you can book, how long you’d wait for each one, and an estimated cost to your destination. Once you hit Book, you go to another confirmation screen, where you can request your ride. 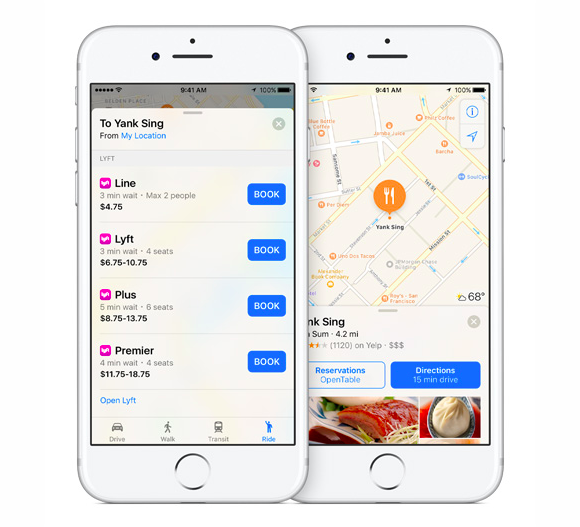 Maps lets you order up a Lyft or an Uber from the Ride tab (left), and book restaurant reservations by tapping the OpenTable button on supported locations’ results pages. OpenTable is integrated with Maps too. You can search for restaurants by category, or just tap the Food button and then Restaurants to find places nearby. Tap a restaurant in the results, either in the list or on the map itself, to see its preview card with restaurant type, how far away it is, hours, and the Yelp rating and price level. If the restaurant takes reservations through OpenTable, you’ll see a Reservations: OpenTable button next to the one for directions. Just tap that for a screen of options for completing your booking, which can be done in as little as two taps. The reservation is also added to your calendar, with a time-to-leave alert set automatically. To alter or cancel it, just visit the OpenTable app. 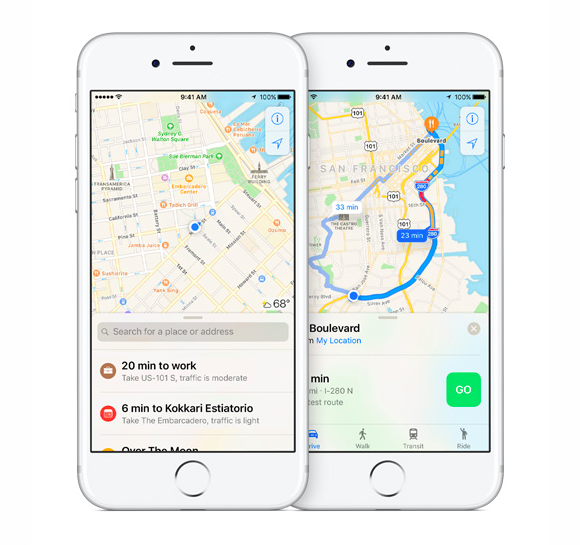 Speaking of time-to-leave alerts, if you add location data to your calendar appointments, the Maps app will calculate how long it should take to drive there, based on current traffic conditions. Then you’ll get a notification a little bit before you have to leave, in order to arrive on time. If you prefer to walk or take transit, just change the Preferred Transportation Type setting in Settings > Maps. While you’re actually navigating somewhere, most of the screen is taken up by the map, which helpfully flips to night mode in the dark. You’ll see the next turn clearly notated on the top, and a strip along the bottom with your ETA, remaining minutes, and remaining miles, along with the unmistakable red End button. While you're driving, the next turn is clearly marked at the top, and the strip of info at the bottom can be pulled up for more options, like finding gas or food along the way. You can pull up that bottom strip easily with your thumb for more options, all presented as big round buttons it’s easy to recognize and hit, even when holding the phone in one hand—the menu doesn’t extend to the upper half of the screen, so everything is within reach. The options are Gas Stations, Restaurants, Coffee, Overview, Details, and Audio. Overview pulls up to a map of your entire route, with your current location clearly marked. Details is a turn-by-turn list, for when you’re in the passenger seat and the driver wants to hear about the next few turns. Audio is where you’ll select the volume for the voice cues (or turn them off), as well as if you want podcasts and audiobooks to pause when the navigation voice butts in. As I said earlier, requesting gas, coffee, or a restaurant while you’re navigating is much improved—in my tests since the beta period, it’s faithfully directed me to locations on (or directly off of) my current route of travel. Those routes themselves are pretty solid, too. I haven’t gotten bad directions yet, with testing in the Bay Area and Sacramento, Seattle and points north, Chicago, Milwaukee, and Cincinnati. (It’s been a busy summer.) 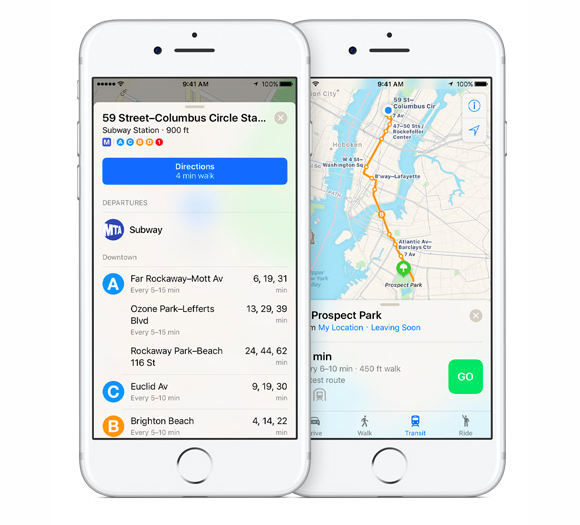 Walking and transit directions work as well as they did in iOS 9—aside from the app’s new look, those features haven’t changed much. Transit directions are reliable in my experience, and I love how the icons in the Maps app match the signs used by the actual transit authorities. The Maps app itself is also solid, although I did experience more than a few crashes earlier in the beta period, especially when paired with an Apple Watch running a beta of watchOS 3. The biggest problems were my iPhone running hot while navigating, the navigation crashing (as in, the Maps app stayed open but I was no longer getting directions), or the directions not stopping when I reached my destination, which had a nasty side effect of draining the battery if I didn’t notice and press End for a while after arriving. But as of a week or two before iOS 10 went live, the app’s stability improved by leaps and bounds, and today, I don’t have any of those problems. Maps has three widgets you can add to your Today view in iOS 10. That mark even shows up as a suggested destination. If you have the Maps Destination widget in your Today view, your parked car will be included, so you’re never more than a couple swipes and a tap from getting walking directions back to your ride. Maps has three Today widgets that you can mix and match depending on your needs. Maps Destinations shows upcoming and predicted destinations, like your next calendar appointment or where you left your car. 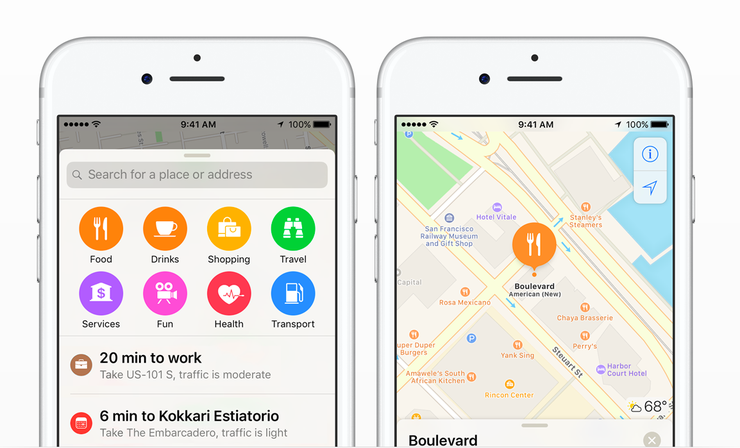 Maps Nearby has buttons that act as shortcuts to searches appropriate for the time and place: coffee in the morning, bars and nightlife after dark. And the Maps Transit widget watches for service alerts on your favorite transit lines, so you know if the trains are delayed again. Tap any of those widgets’ controls to quickly launch Maps right to where you want to be—pretty appropriate for a map, isn’t it? What do you think about the Maps app in iOS 10. Are you satisfied with the more minimal design? Do you love the widgets? Did Apple leave out a feature you think it needs to have? Let us know in the comments.